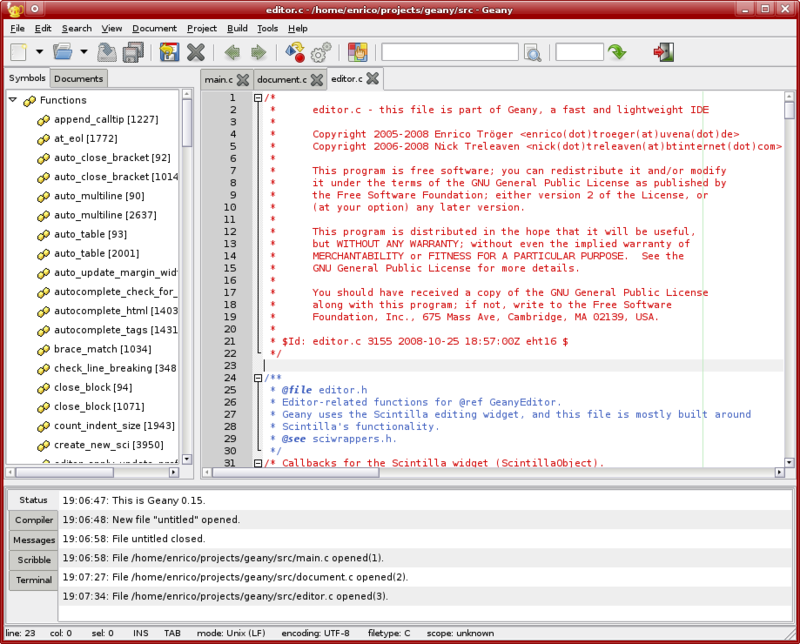 Geany is a text editor using the GTK2 toolkit with basic features of an integrated development environment. Geany was developed to provide a small and fast IDE, which has only a few dependencies from other packages. Geany supports many filetypes and has some nice features. Geany is known to run under Linux, FreeBSD, NetBSD, OpenBSD, MacOS X, AIX v5.3, Solaris Express and Windows. More generally, Geany should run on every platform. * Implement a graphical toolbar editor. * Implement Most-Recently-Used document switching when pressing 'Switch to last used document' keybinding (Ctrl-Tab). * Add 'Reflow lines/block' keybinding, (Ctrl-J). * Support 'tab indents, space aligns' style when indenting. * Add 'Autocomplete all words in document' pref; also used when forcing autocompletion and there's no symbol names to show. * Reload color schemes via Tools menu. * Implement named styles support for filetypes. * using a filetypes.common [named_styles] section; used as "style=named_style,bold". (See the manual for details). * Allow indentation of wrapped lines (see style 'line_wrap_indent'). Qweas is providing links to Geany 0.20 as a courtesy, and makes no representations regarding Geany or any other applications or any information related thereto. Any questions, complaints or claims regarding this application Geany 0.20 must be directed to the appropriate software vendor. You may click the publisher link of Geany on the top of this page to get more details about the vendor.